Shops, restaurants and the main port of the island, i.e. 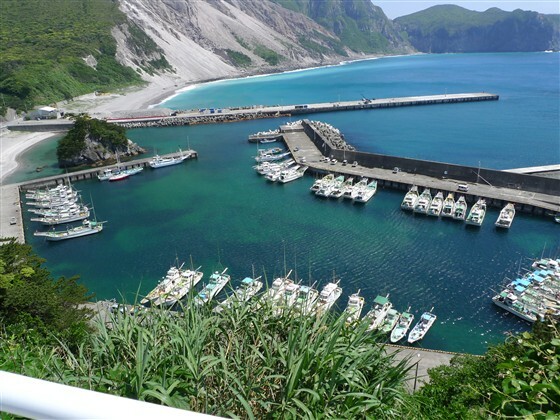 Kozu-shima Port, are on the west coast of Kozu-shima Island. Miura Fishing Port at Takoh Bay on the east coast has no shop nor restaurant. 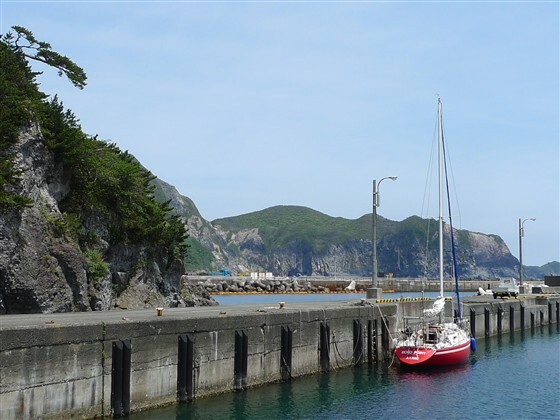 But, Miura Fishing Port is a larger, calmer and beautiful berthing place for sail boats. You may moor almost any open space in the port of refuge. Watching a white lighthouse, 34 12.000N　139 09.500E , at the end of a long breakwater on your left, and watching a yellow mark with light on your right, you move into the port. Turn right to go around behind the yellow mark. Ahead on the left, you will now find a small white lighthouse at 34 12.04N 139 09.31E, which can not be seen from outside of the port. At the foot of the small white lighthouse, you turn left in a narrow waterway. Then you will see a local fishing boats pool with wide view. A breakwater on your right running from west in the boat pool is a berthing place. 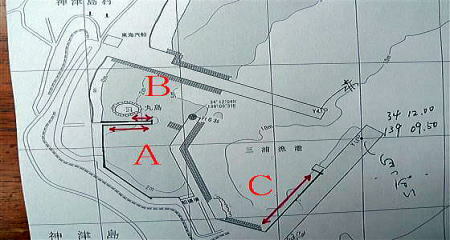 A) At the south side of the breakwater above running from west is the best berth. 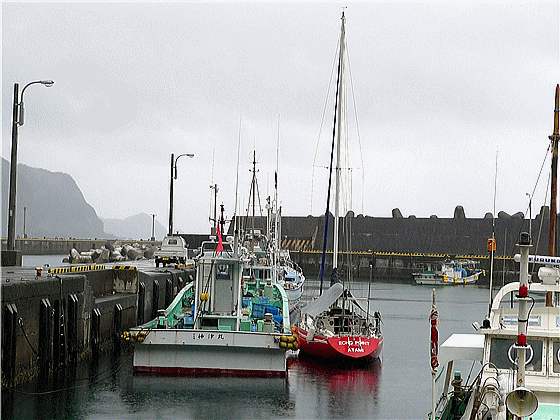 As it is located in the back of the port, it is calm. When I visited, a local fishing boat was mooring alongside. One or two sailing boat can be moored. B) At the opposite north side, i.e. the nearside of a small rock, of the breakwater above, one or two sailing boats can be moored either. C) There is a wide open space outside of the boat pool and behind the long breakwater. You may moor there in calm conditions such as in summer. No anchoring in the boat pool ! When I tried to drop anchor as usual, a fishier man called me and said “no anchoring” because there were wires laid on the seabed. He advised me to moor alongside. 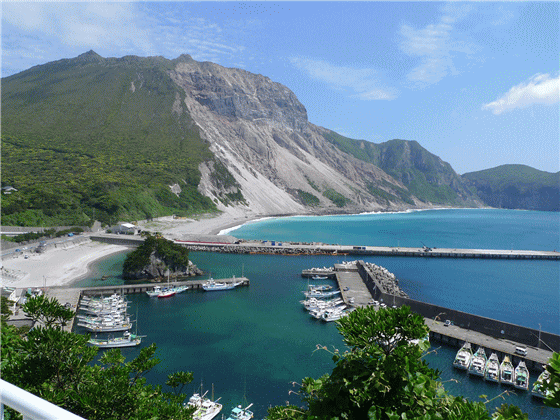 Kozu-shima Island is the most water-rich island in Izu Seven Islands. there are water taps at nearby toilet and shower facilities. In addition, at Takoh Bay, there are great springs which are running out delicious water 24 hours. I recommend you to take the delicious water for your drinking. For a bathhouse, take bus services from Takoh Bay to Kozu-shima Port on the west coast, and then to Kozu-shima Onsen (Spa) Hoyo Center. Total JPY400 bus fare. JPY800 for the bathhouse, which requires you to put on swimming wear. Fuel is available at Kozu-shima Nenryo (Fuel) 04992-8-0222, which price is high. JPY200/litter, which makes JPY4,000 for 20 litters ! For a shops and restaurants, take JPY200 bus services from Takoh Bay to Kozu-shima main area on the west coast.